Do you do a lot of tailgating? Are you tired of the sun, rain, and bugs bothering you? Are you looking for a tailgate tent with sides to help keep you comfortable? In this article, we’ll show you five great tailgating tents with walls to help you enjoy yourself more than ever before. These types of tents are great for tailgating because they can protect you from the sun’s rays as well as other weather issues. You can even enjoy your food bug-free when you sit inside a tent with mesh walls. Pick up your favorite from this list and get ready to see what a difference it will make in your tailgating experience! Last update on 2019-04-26 at 06:16 Product prices and availability are accurate as of the date/time indicated and are subject to change. Any price and availability information displayed on [relevant Amazon Site(s), as applicable] at the time of purchase will apply to the purchase of this product. Pick up this set of Caravan Canopy Sports Commercial Grade Sidewalls when you need an extra set of walls to use with your existing canopy. This set includes four individual walls, one of which has a zippered entry option for use as a door. This is an easy and lightweight set of walls to put up. These walls should match almost any 10x10 canopy. This is a set of walls only and doesn’t include a frame or canopy. The walls only come in white. With the Quik Shade Go Hybrid Backpack Canopy, you can quickly and easily get your tailgating started. This canopy is 7x7 so it’s a little more lightweight than some of the larger options out there. It features a powder-coated steel frame that’s both light enough to set up alone and sturdy enough to stay firmly in place. With its included storage backpack, you can haul this quality tent along with you wherever you may need to go—or just keep it in your truck for any time the mood strikes. This product only weighs 14 pounds, so aside from tailgating, it’s also great for taking along on a camping trip. The product comes with stakes to help keep it in place. 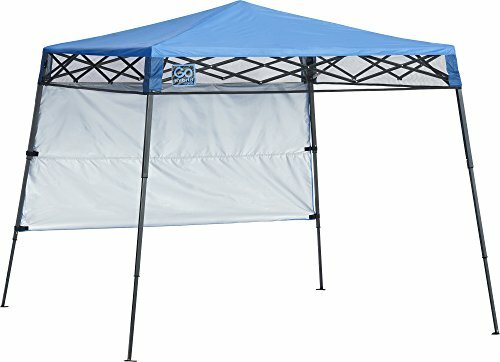 This tent comes with only one side panel, and this panel does not extend all the way to the ground, so it can really only be used for sun protection. The canopy is only about five feet tall for clearance, so you can sit under it but may not be able to stand beneath it. 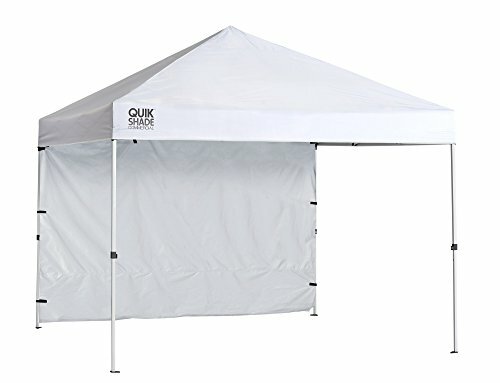 Choose this Quik Shade Commercial Instant Canopy with Wall Panel and get ready to party! 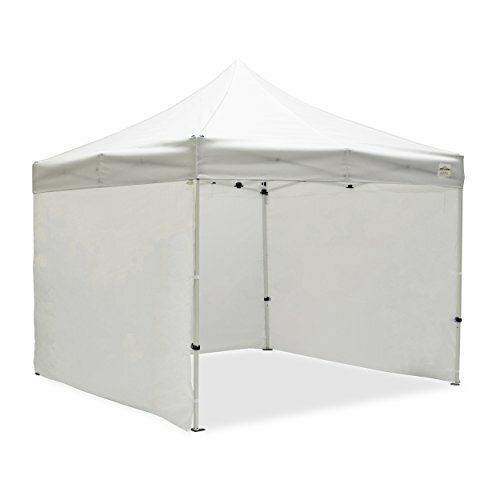 This tent is 10x10 when assembled and comes with a single optional wall panel. This panel can be put in place or taken down with no trouble, and the tent itself can be adjusted to three different height options as needed, too. 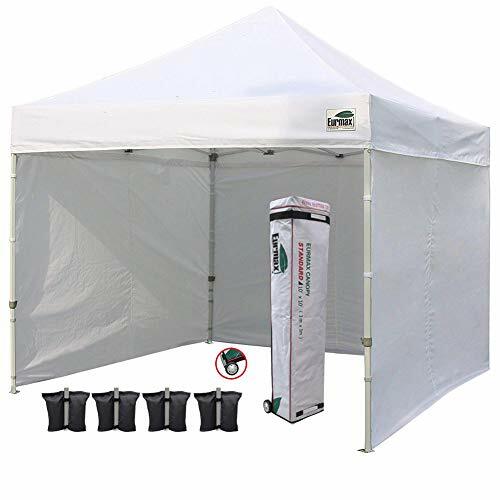 The power-coated steel frame is built to last, and the thick and durable polyester canopy itself will protect you and your whole family from the sun as well as the rain. The canopy is lightweight and easy to bring along with you for all your tailgating needs. It only takes a few minutes to get this canopy set up with or without help from someone else. This product only comes with one mesh sidewall, so you may need to purchase extras if you’re looking for more privacy or protection from the elements. This product only comes in white, so you don’t have a lot of options when you’re looking for something to stand out or match your team. Enjoy your tailgating experience from start to finish with this ABCCanopy Ez Pop Up Canopy Tent. This tent comes with a canopy and four sidewalls as well as a carrying bag on wheels, ropes, takes, and even sandbags. You’ll be able to quickly and easily set up this tent and get it secured in place for tailgating as long as you want to. The polyester fabric is water-resistant, and the walls can be removed or replaced individually so you can set up the configuration you need the most. 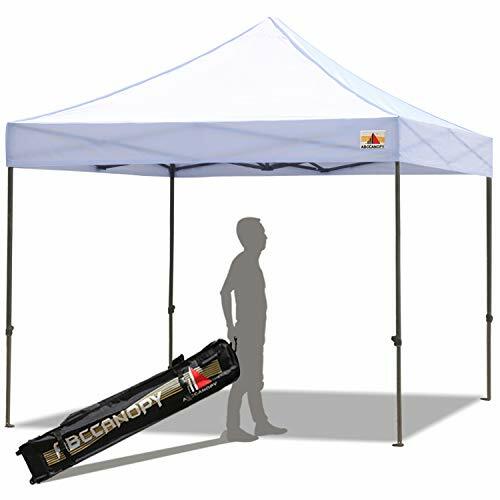 This tent canopy comes with a very sturdy and thick frame that doesn’t collapse easily and won’t blow over in the wind. The canopy’s walls are simple and easy to remove as needed with their Velcro fixtures. This product only comes in white, so if you’re looking for something to let your team spirit show, you may want to look elsewhere. The product is a little bit difficult to keep clean. Bring home the Eurmax Ez Pop-Up Canopy Tent and enjoy tons of fun in the sun without having to worry about getting sunburned! This 10x10 tent is spacious enough for all your tailgating needs and it even comes with four separate removable sidewalls so you can use it no matter what the weather situation might be. Set it up with the help of another adult and adjust the walls and height as needed to get the results you’re looking for right away. This canopy with walls comes in several different colors so you can easily find one to help you show your team spirit. The canopy is designed to be both water-resistant and waterproof, and it features durable sealed seams to prevent water from getting inside, too. Because of all of its extra features, this tent is a bit more expensive than some of the others listed here. The mesh windows on this tent may be torn in some rare situations, although the company should replace the product if this happens to you. Always use stakes and ropes to secure your tent. Use sandbags whenever possible to hold everything in place. Be sure you stake your tent in something more durable than sand if possible. By keeping these tips in mind, you’ll be on your way to a safer and more enjoyable tailgating experience in no time!